“Jamie Fraser would be Deeply Gratified at having inspired such a charmingly funny, poignant story—and so am I.”—Diana Gabaldon, #1 New York Times bestselling author of the Outlander seriesEscape to Scotland with the delightful new novel that readers have fallen in love with—inspired by Diana Gabaldon’s #1 New York Times bestselling Outlander series. I met Jamie Fraser when I was nineteen years old. He was tall, red-headed, and at our first meeting at least, a virgin. He was, in fact, the perfect man. That he was fictional hardly entered into it... On the cusp of thirty, Emma Sheridan is desperately in need of a change. 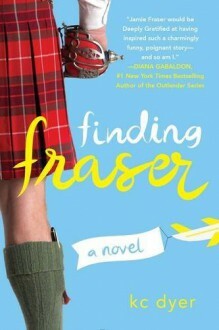 After a string of failed relationships, she can admit that no man has ever lived up to her idea of perfection: the Scottish fictional star of romantic fantasies the world over—James Alexander Malcolm MacKenzie Fraser. Her ideal man might be ripped from the pages of a book, but Emma hopes that by making one life-altering decision she might be able to turn fiction into fact. After selling all her worldly possessions, Emma takes off for Scotland with nothing but her burgeoning travel blog to confide in. But as she scours the country’s rolling green hills and crumbling castles, Emma discovers that in searching for her own Jamie Fraser, she just might find herself.